(From DFH's website) A cross between a Scotch Ale, an I.P.A., and an American Brown, this beer is well-hopped and malty at the same time. It is brewed with Aromatic barley and caramelized brown sugar. 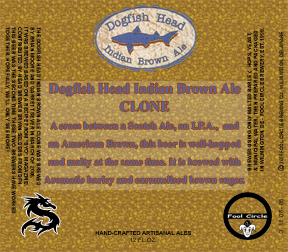 The Dogfish Head Indian Brown Ale Clone was brewed by Brian Moore and Garrett Sever in March of 2006. It was brewed based on a recipe from �BYO� magazine contributed by Head Brewer Bryan Selders from DFH. This beer was the second time these two brewers have worked together. hopefully, we�ll only see more! Please visit: www.dogfish.com for more information about Dogfish Head Craft Brewed Ales and all the fine stuff they do, also www.byo.com to learn more about a great beer magazine, and www.thesevers.com to hopefully prod Garrett to keep his homebrew section of his site better up to date (just like Fool Circle always is ;)).